I'm checking another card off my cousin's order with this one. Two down, two to go. 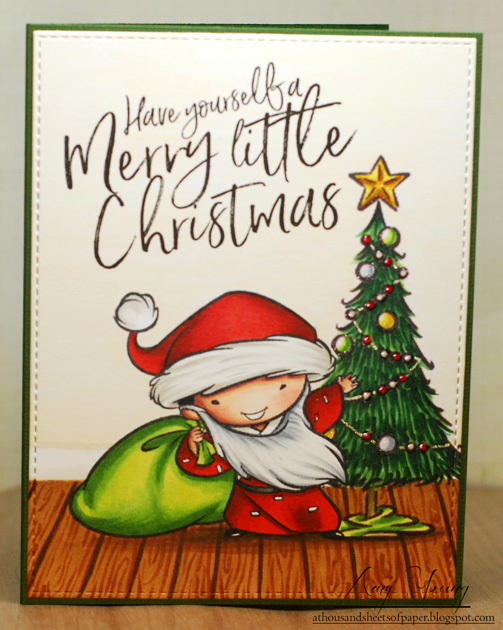 For this one I inked up happy little Setsuna from Sister Stamps and paired him with a Christmas tree from Impronte d'Autore. I'm 99% sure that they are drawn by the same artist so they really look great together. In keeping with my one layer rule for these cards I colored in a wood floor and wall behind them to pull the simple scene all together. I also made sure to leave a lot of open space up above because I really wanted to use this cool sentiment with Setsuna. To finish it all off I added plenty of sparkle and gloss to the ornaments decorating the tree.